Congratulations, you have reached the end of the first trimester, meaning that you are one third of the way through your pregnancy. Development of the internal systems is now taking place. For example, the bone marrow is already making white blood cells which it will use later in life to fend off germs. At the moment, your baby's head makes up about half of the total length, crown to rump. 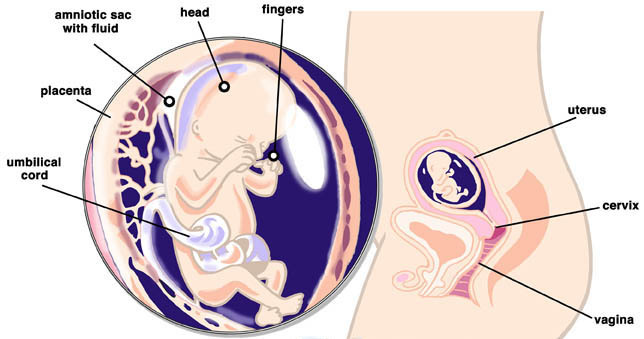 The torso will lengthen over the course of the forthcoming months so that when the baby is born the head will only be about a quarter of the total length of the baby. The baby has already developed a sucking reflex in its cheeks and gentle pressure on the uterus may cause it to root, (this is a reflex causing the baby to automatically turn their face towards a stimulus and make sucking motions with the mouth). This is all in practice for breast feeding once they are born. By this week you should hopefully find that most of your unwanted pregnancy symptoms have subsided. Many women refer to the second trimester as the 'honeymoon period'. You will probably find that you feel more positive and energetic during the next three months or so. Have you noticed a dark line appearing on your tummy? This is called linea nigra and is quite common amongst pregnant women, although equally there are many women who do not experience it at all. This is actually a line you have had all along, but it was white and probably not very visible pre-pregnancy. Your hormones are responsible for another bodily change as they cause the darkening of this line. The darkening usually starts around now and disappears within a few months of giving birth (although for some women it never truly disappears). There is no scientific proof to this but for your own amusement you may be interested to know that an old wives' tale states that if the linea nigra runs only as high as the belly button then you are having a girl, but if it extends above the belly button then you are having a boy! You may find that your gums are bleeding more now that you are pregnant. As well as brushing at least twice a day, it is also really important to floss regularly to keep your teeth and gums in a healthy condition. Choosing when to tell your friends, family and colleagues that you are pregnant is a very personal choice that only you can make. One thing is for sure though, as your pregnancy continues, there will come a time where it is rather a difficult secret to conceal! Most women choose to wait until the end of their third trimester before going public with the news. This is because the risk of miscarriage has, by now, significantly reduced; eighty percent of miscarriages occur during the first trimester of pregnancy. Did you know that you are entitled to free prescriptions from the doctor and free dental care until your baby is one year old? Your midwife will give you a form which you need to complete and send away in order to get your maternity exemption card. Page generated in 8.0935 seconds.